The Firefield NVRS Tactical 2.5x50 uses enhanced optics, a durable, titanium body and sleek design to separate itself from any other night vision riflescope. The NVRS Tactical 2.5x50 has internal focusing ability and an ergonomic design to allow for more comfort during shooting. 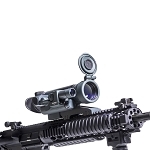 It is also equipped with a powerful 50mm lens to provide higher resolution and light gathering capabilities, and flip-up lens covers open to reveal quality multi-coated optics and an illuminated reticle. 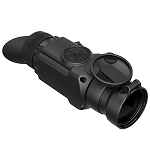 A built-in, powerful Pulse infrared illuminator is easily activated to enhance image brightness and increase range in total darkness; a precision windage and elevation adjustment and remote are additional features.